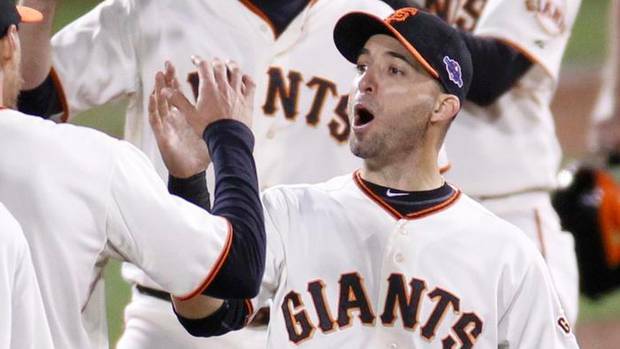 Marco Scutaro has been absolutely unconscious this postseason – multi-hit games seemingly every night, pesky at-bats driving pitch counts through the roof, clutch RBIs. What, exactly, is this guy’s secret? It’s not rocket science: His neck never gets cold. 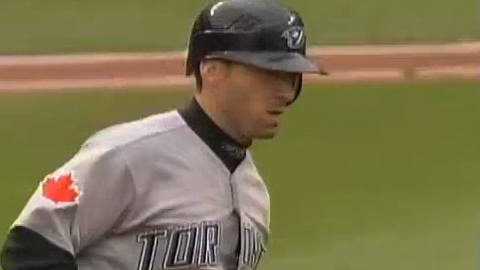 A slightly more youthful Scutaro back when he was a bit greener and carefree. During his stint in Colorado earlier this season, Marco opted for a simple black Nike mock T-neck, almost as though he had some premonition he’d be ending the year on another team with black in its logo… (AP Photo). The weather forecast for this weekend in Detroit? Temperatures dipping into the high-30s… (Reuters). Chances are, at this very moment somewhere in the Boston area, someone is practicing his or her Scu-Scu-Scutaro flex pose a la Patrick Bateman. A business man, noticing his reflection in a train window as his Red Line T heads underground, risks tearing the stitching on his designer suit to do a flex-and-point—all the while holding his briefcase and folded copy of the Wall Street Journal. A seemingly timid intern steps into the ladies’ restroom of a Cambridge-based research laboratory to flex her pose in the mirror after MLB’s Gamecast indicates that the Red Sox shortstop has drawn a base-on-balls, igniting a key rally. A Boston Police officer reroutes traffic down a dead-end street because he refuses to change the positioning of his right arm, which points at his reflection in a building’s facade as he thrusts his hips to and fro while blowing his whistle erratically. Boston’s slick-fielding, sure-handed, at-bat-extending, fundamentally sound shortstop’s popularity continues to skyrocket as quick as the team’s place in the standings. Last week’s release of the Scu-Scu-Scutaro video on YouTube has the city awash in fans humming the parody, set to the tune of the 1985 Phil Collins hit “Sussudio.” The original song, which has been a staple on generic easy listening stations for more than two decades, has invaded the subconscious of Red Sox Nation. “Sussudio” served as the soundtrack to Patrick Bateman’s psycho-sexual, nocturnal blood lust in the movie American Psycho. Similarly, “Scu-Scu-Scutaro” has quickly become a fitting ode to a player who murders the opposition’s pitching staff with his pesky hits, plate discipline and sure hands in the field. 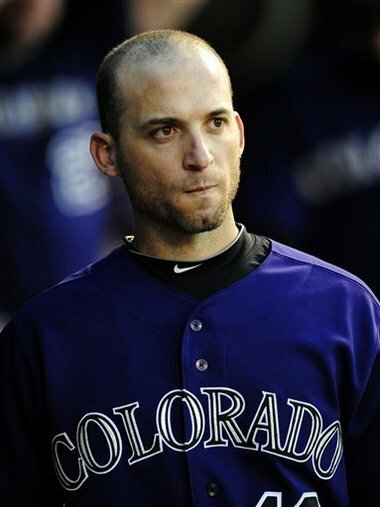 Of course, there are some unintended consequences that have sprung up as a result of Scu-Scu-Scutaro Fever. For example, a six-inning Little League game this past weekend in Belmont lasted well over four hours due to the mounting number of 11-year-olds who have begun emulating Scutaro’s selectivity at the plate. Stevens echoes the concerns of many youth baseball coaches in the area who have observed similar obsessions with the Scu-Scu-Scutaro way. The pitchers have become too good. The hitters have become too patient—all too willing to strike out or take walks in pursuit of the perfect home run pitch. Meanwhile, the fast-paced athleticism required in football continues to present a formidable challenge to baseball’s distinction as the national pastime. It is high time baseball hit back, so to speak. It is time to increase the action and make the game manlier and more entertaining to a wider range of fans. It is time to let hitters hit off tees and eliminate the effeminate motions of modern pitchers’ deliveries. Basically, today’s ballplayers are a bunch of contact lens-wearing dandies overly concerned with exercising plate discipline, making pitchers tired and winning a bunch of baseball games. 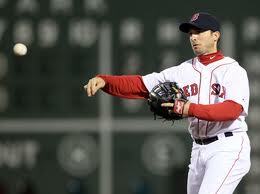 Some teams, such as the particularly influential Yankees and Red Sox, are especially patient. The Red Sox, for instance, in April chose not to swing at 41 percent of pitches that actually were in the strike zone. Pitchers could be forbidden from throwing the Devil’s fastballs otherwise known as the “cutter,” a pitch that some of Verducci’s sources (the Yankees hitting coach) have blamed for the decrease in balls put in play and thus the pleasing crack-of-the-bat sound in ballparks. However, the rule would be difficult to police due to the large room for interpretation and potential grip modifications that could be employed to get around any newly implemented rules. A tee is really the only way to make the game more interesting while also keeping it fair. On top of all that, cumbersome statistics such as pitch counts and pitch F/X data would be a thing of the past. For their part, players asked about the debate in the clubhouse prior to Tuesday night’s game at Fenway Park were skeptical. “I’d stare at it for a few minutes to see if it fell off the tee, but I guess eventually I’d swing at a baseball if it were set on a tee,” said Marco Scutaro, who was 13th in the American League in pitches per plate appearance in 2009 (4.07). John Henry and every other red-blooded market capitalist will tell you that purchasing commodities in bulk well in advance of their expected maturity in value is the perfect way to maximize riches in a down economy. Along that vein, Fenway Pastoral is here to analyze the latest ten-fecta of Sox Pax ticket packages, which go on sale this Saturday, December 12 online, over the phone and at the team’s Christmas at Fenway Event. 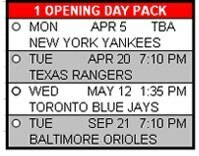 Sox Pack 1 is an “Opening Day” collection that guarantees a ticket to Boston’s very first game of the season, which is against the New York Yankees. Fans cannot go wrong with this selection for their Sox Pack purchase, despite the inclusion of clunker games against the Texas Rangers and Baltimore Orioles. Meanwhile, the May 12 game against the Blue Jays scheduled for 1:35 p.m. will have a certain slap-in-the-face feeling for those who already played hooky or skipped work six weeks earlier to see Opening Day. The Bottom Line: You’re going to Opening Day against the hated Yankees, which means you can toss verbal barbs at CC Sabathia or Roy Halladay from the grandstand. Pack 3 is the TGIF “Thank Goodness It’s Friday” set. Twenty years ago, this package would not have sold very well due to stiff competition from ABC’s enormously popular TGIF television sitcom lineup that included classics such as Full House, Family Matters and Perfect Strangers. Tivo, DVR and Hulu have rendered appointment viewing an artifact of the 20th Century that no one will be able to seriously acknowledge in 50 years without snickering. In short, ABC’s TGIF phenomenon will make about as much sense as Derek Jeter’s Gold Gloves. 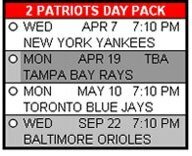 Who do the Red Sox think they’re kidding with their “Saturday Special” and “Sunday Special” Sox Packs (#s 4 and 5)? All game times are listed as TBA and both include two September games. 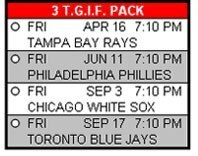 Fans purchasing either of these packs will need to clear their schedules for two full weekend days that are more than nine months away. All Home Depot and Bed, Bath & Beyond jokes aside, solidified weekend schedules are a must when constructing large signs with clever four-word combinations for the NESN or ESPN acronyms. Making last-minute signs using a Sharpie and the flimsy cardboard from a Busch Light 30-pack just doesn’t have the same effect. 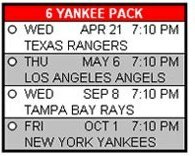 The selling points for the “Yankee Pack” and “Pinstripe Pack” (#s 6 and 7) center on the possibility that the final regular season games of the year, three home games against the Yankees, will serve as de facto playoff games. It could happen, but it’s just as likely that several of the games wind up with someone like Jeremy Hermida hitting cleanup. On the flip side, the September 8 matchup against the Devil Rays is likely to have strong playoff implications. Meanwhile, Pack No. 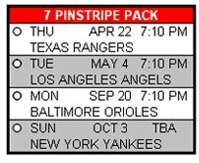 7’s September 20 game against Baltimore could be one of those playoff spot clinchers, which can be especially fun for those fans interested in witnessing (or joining) drunken revelry in person. The No. 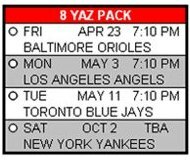 8 “Yaz Pack” also features a Yankees game during the final weekend of the season. The bonus here is a complimentary 12-month prescription to the birth control pill that shares a nickname with the immortal No. 8. This ticket package is solid, especially so for sexually active female fans between the ages of 15 and 50. These types of cross-promotions would never have been offered on John Harrington or Tom Yawkey’s watch. 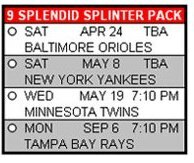 Sox Pack #9 is a “Splendid Splinter” collection featuring three important AL East divisional dust-ups as well as a ticket to see the perennially underrated Minnesota Twins. Sure, AL MVP Joe Mauer is likely to remain one of the best players in the league next season, but this Sox Pack does seem to lack a certain punch. Fenway Pastoral gets the feeling these are the types of games in which ownership will heroically give up John Henry’s dugout seats to some charitable foundation rather than waste Ben Affleck’s time. But seriously, these Packs make great stocking stuffers. In trying economic times, deals such as the No. 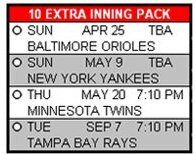 10 “Extra Inning” Pack really cannot be trumped. The organization has pinpointed four games throughout the 2010 season that will go into extra innings, giving fans added value at no additional price. In 2009, the club was 4-6 overall (1-2 at home) in extra innings affairs. If sample sizes are your cup of tea, Boston was 1-0 in extra innings games played against the New York Yankees at Fenway Park in 2009.